Sunday 30 August 2015 proved to be a golden day for Nene Valley Harrier athletes Hannah Molyneaux and William Hughes despite the rain and winds on the day. Three gold medals on Sunday and a silver on Saturday was one of the best medal hauls in history for NVH and we also witnessed a club record broken on poor weather conditions. Nene Valley Harriers have their own Super Sunday. Hannah not only won the under 15 girls shot putt but her putt of 14.22m broke the Championship record and earned her vouchers for her efforts. 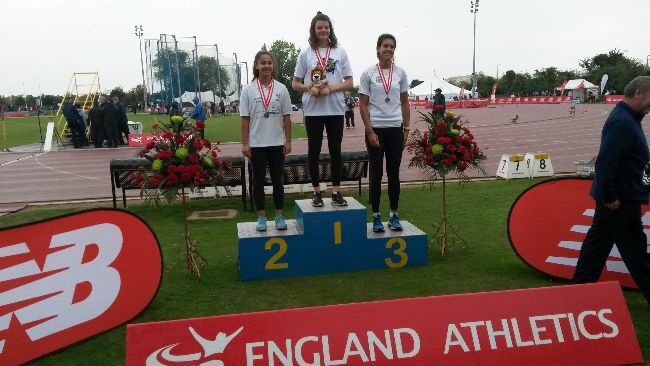 Shortly after winning the competition which now gives her the clean sweep of County Champion, Northern Counties Champion, English Schools Champion and now the England Athletics title the UK under 15 record holder is targeting 15m before the end of the season. Hannah also repeated the clean sheet (of possible titles) above, excluding the English Schools in the girls discus. Competing prior to the shot putt, her main event she started the competition with a big throw of 35.65m to take the title and missed out a few rounds to save energy for later. William Hughes was another double winner at the Northern Championships and was not far away from repeating the feat this weekend. On Sunday, he dominated the under 15 boys 200m heats winning in a time of 22.71 easing off as he headed towards the line. William had been ahead of the field coming into the home straight in that heat. the final was clearly harder work but after hitting the home straight his stride opened up and he pulled away from the field to take the title with a time of 22.82 in very damp conditions but clear of second place. On Saturday, William had raced 100m the sun with minimal wind a complete contrast to Sunday. He ran a comfortable heat finishing in second place, split only by the photo and equal time of 11.47 with the heat winner. In the final, William was pipped by the heat one winner but he beat his heat 2 victor again recording the same time of 11.40 as his heat 2 colleague. 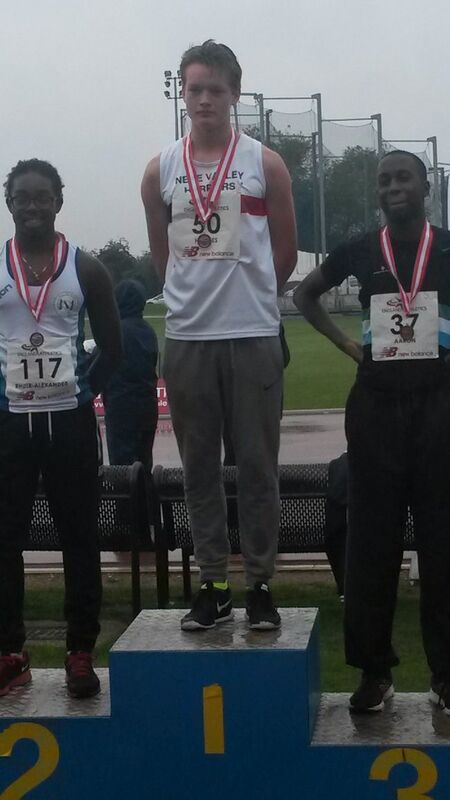 William claiming a gold and silver medal to go with his English Schools bronze medal. William's twin brother Charles marginally missed out on a medal finishing fourth in the under 15 boys shot putt with his putt of 13.45m was just 8cm away from claiming the bronze medal. this was an excellent personal best for Charles considering the downpour in which he was competing. Megan Ellison was another Lincolnshire athlete competing on both days. She ran well on Saturday to get through in her under 17 ladies 800m heat finishing second with a club record time of 2:15.34. On Sunday, she got herself positioned well at the back of the lead group as they went through the bell she fought hard as the speed picked up and then finished strong, passing to competitors in the home straight to claim 5th place with a new club record of 2:14.06. Megan has shown remarkable progression through the season and there are still a few events to go. Tierney Augustine came 8th in the under 17 ladies shot putt with a putt of 11.93m and Elysia Costanzo was 15th in the under 15 girls pole vault achieving a clearance of 2.16m. A new comer to the event and experiencing her first major championships. Callum Crosby completed the first day's NVH competitors in the under 17 men's 100m. Callum who had been suffering with a hip injury attended the meeting to gain experience as a relative newcomer to the sport. His time of 11.75s only really reflected the impact of his hip on the start line as he stayed in touch to the end. Jasmine Allen was undone by the timetable once again. Jasmine competing in the under 15 girls long jump achieved a distance of 5.04m on both her second and third attempts marginally missed the cut by 6cm. Unfortunately as soon as she had completed that third jump she was required to change her spikes and go over to her 200m heat where the previous 2:30 hours of competition and preparation had an effect. She still ran well coming off the blocks and first bend in the mix but the tiredness left her with a time of 26.92. The club's 300m record holder has gone close to the 200m and long jump records and could easily achieve these marks in the last few events of the season. Josh Akinwumi was in the fastest under 17 100m hurdles heat and recorded a personal best time of 13.85s finishing fourth in his heat. Rosie Fresen also attended the final day despite suffering from a wrist injury. The deteriorating weather which got more and more wet during her warm up unfortunately had to pull out of the under 17 ladies pole vault after her very first attempt due to the weakness in her wrist and the wet pole. Rosie still has two key competitions coming up including the UK School Games and did not wish to risk serious damage. The Lincolnshire side of the club were well represented by the same athletes who had helped the county to win the Schools title at the English Schools a month ago. A great weekend for the club and two great medallists - all those competing over the weekend are down to earth and friendly athletes. They were brilliant representatives for the club.